The Table of Elements seems to be a very popular starting place for implementing new media in education. In July I posted about learning the table of elements via video. 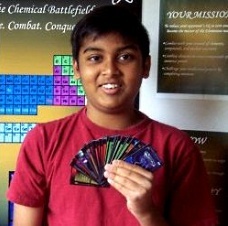 "Combines chemistry facts with fantasy in a board-based card game." VentureBeat has the transcript of an interview with Samar, the CEO of Elementeo. Samar created quite a buzz at the TiECON conference last year as the wonder kid 13-year old CEO. Check out this YouTube video of his elevator pitch. "Samar argues that textbooks are boring and kids would rather spend their time battling enemies, blowing things up with bombs, and yes, even giving their opponents lead poisoning. So he created a fantasy role playing game that combines the rapturous teenage joys of competition and carnage with the exciting properties of the periodic table of chemical elements."